As promised at the beginning of the year, I continue with my small challenge of publishing a new recipe inspired by Japanese cuisine every month. After having posted my recipes for Ramen Low carb, Dorayaki with Anko, Okonomiyaki with shrimps and Pork with ginger, today I propose this recipe for noodles with vegetables and tamari sauce. It is an easy and quick recipe to prepare and 100% free of gluten and vegan. It is a very appropriate recipe for a quick and original lunch or dinner. Phase 1 Serves: 2 Prep Time: 15 min. Cooking Time: 15 min. Wash and cut the vegetables: chop the ginger, garlic, and onion, cut the zucchini into slices and mushrooms into quarters. In a wok or a large, put all the vegetables in the broth and sauté over medium heat for about 10 minutes. Meanwhile, cook the noodles in plenty of water, during the time recommended by the container. When the pasta is cooked, strain it and add it to the vegetables. Add the tamari sauce and adjust salt and pepper. Skip another minute. Serve with fresh parsley leaves and a little ginger powder. 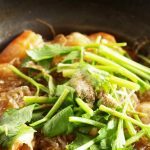 This recipe is suitable for the Fast Metabolism Diet – DMA Phase 1; With these quantities, you get 2 grain and vegetable servings for <20 pounds.